Upon arrival at Bagdogra airport/N.J.P train station, you are met by our guide and driven to Latuguri (about 150km/ 3hrs drive). The road climbs up from Siliguri, crossing the Bhagpool towards Phuntsholing but the small town of Chalsa, we take a side road of around 12kms through lush tea estates and paddy fields to Lalitguri. Gorumara national park is just adjacent to Lalitguri, where the resorts are located. 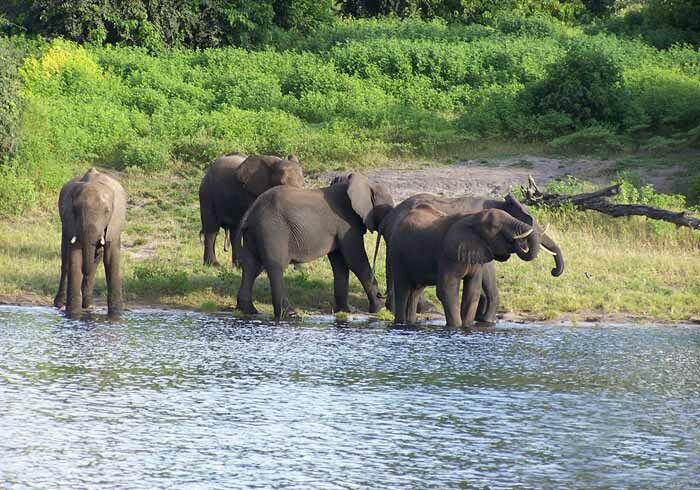 In the morning take a safari inside the Gorumara national park (10Kms). 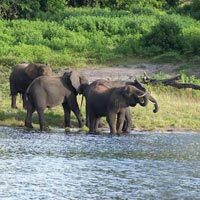 As you pass through the dense forests you may come across the herd of elephants/Bisons crossing your way. The watchtower beside the Forest Rest House gives a panoramic view of the entire park and the Murti Valley. Most common animals in the area are one horned Indian rhino, Elephant, Indian Bison (commonly known as Gaur), Leopards (locally known as Chitabagh), Rock Python, Malayan Giant Squirrel and deer as they regularly come to the salt reservoir just below the tower. Drive to Chapramari wildlife sanctuary (30kms) via Murti. Inside the Chapramari forests there is a small pond, where mostly the elephants and the Indian Bisons come to drink water. The forest rest house inside gives a magnificent view of the pond surrounded by forests. Return to your lodge at Lalitguri. Overnight in a resort at Lataguri. After breakfast, drive to Kalimpong via Lava town (130km/ 4- 5hrs drive). The drive goes through series of tea gardens, river valleys and many small picturesque hill side villages. Stop at Lava to enjoy the breathtaking landscape that surrounds you. Lava is one of the most picturesque rural town in the Darjeeling Himalayas, situated at an altitude of 2100m. You may also wish to visit Lava Monastery and continue your drive to Kalimpong through the pine forests. This evening, stroll through the township of Kalimpong (1250m), once an important trading center between Bhutan, Sikkim & Tibet. After breakfast, visit Durpin Dara for amazing views of the plains, and nearby you can visit ZangDog Palri Fo-Brang Gompa temple. Drive up to Delo hill for bird’s eye view of Kalimpong town. On a clear day, you can also see magnificent view of Mt. Kanchendzonga from these view points. Later visit the flower nurseries, Dr.Graham’s Homes, a well respected boarding school built in 1900s. Visit Trongsa Gompa or Bhutanese monastery and more time for stroll in the bazaar. After breakfast drive to Darjeeling(2134m), which is around 85kms/2-3hrs drive through picturesque tea garden, especially the one at Peshok. Along the way, among other stop, we can stop at Triveni view point, to see the view of the confluence of Teesta and Rangeet rivers at a point that is known as Lover's Meet. Upon arrival in Darjeeling, check into your hotel. After high tea in the evening, stroll around Chowrasta Mall. Early this morning (before dawn), drive to Tiger Hill (14 km) to get a magnificent view of sunrise over the mt. Khangchendzonga and other peaks of eastern Himalaya (weather permitting). On your way back to the hotel visit Yiga cheoling monastery at Ghoom build in the year 1850 - oldest in the town. After breakfast, take a toy train up to Ghoom. Later visit Padmaja Naidu zoological park, known for its successful breeding of snow leopards and some other Himalayan species. Nearby visit Everest museum at Himalayan mountaineering institute, followed by visit to Tibetan refugee self help center. In the evening, explore the local markets at Darjeeling and visit tea shops. After breakfast, drive to Bagdogra airport/NJP train station for return or extend into Sikkim/Bhutan or other destinations.